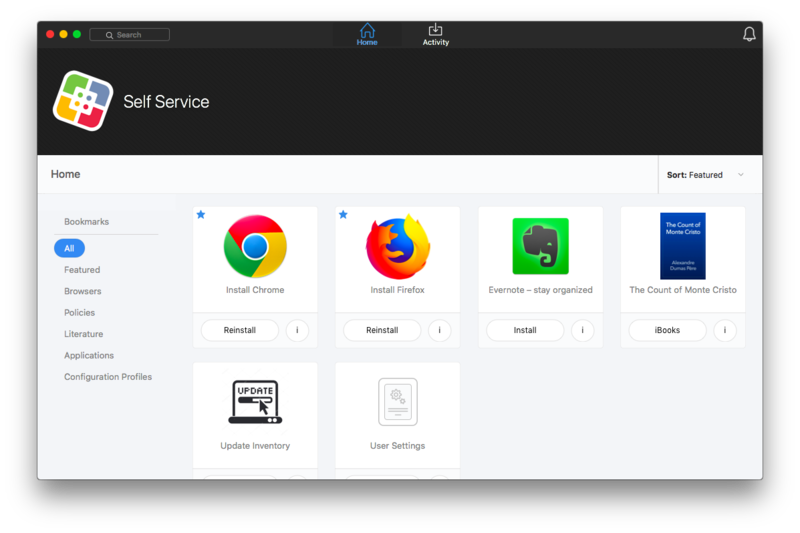 The Jamf Self Service for macOS application allows users to browse and install configuration profiles, Mac App Store apps, and books. Users can also run policies and third-party software updates via patch policies, as well as access webpages using bookmarks. Users can point and click their way through Self Service using the intuitive interface shown in the screen shot below. Jamf Pro allows you to manage every aspect of Self Service, including its installation, user authentication, and the items available to users. In addition, you can configure how Self Service is displayed to users by replacing the default Self Service application name, icon, and header image with custom branded elements to present users with a familiar look and feel. You can make any configuration profile, policy, software update (via patch policy), Mac App Store app, or book available in Self Service and customize how it is displayed to users. This includes displaying an icon and description for the item, including the item in the "Featured" category, displaying it in relevant categories, and displaying item-specific notifications. You can also specify which computers display the item in Self Service and which users can access it. In addition, you can make bookmarks available in Self Service to give users easy access to webpages directly from the application. Find out how to install Self Service on managed computers. Find out how to require or allow users to log in to Self Service. Find out how to customize how Self Service is displayed to users.